I’ve started my afternoon of walking in Auckland, New Zealand. Check out was 11:00 – graciously extended to 14:00. But my flight isn’t until 19:30. So I headed over to the Auckland Museum, only to be caught in the rain. I’ve sought sanctuary through a near endless choice of coffee shops, skipping all of the Starbucks for a local establishment with modern decor and lots of patrons. 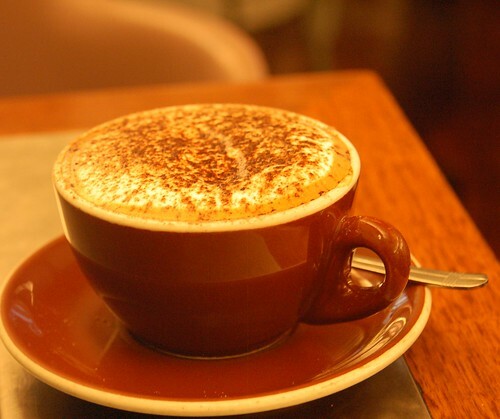 I ordered a cappuccino — also a bit out of character for me. I’m usually fairly energized by a new and exotic place, but right now I just want to go home. Brenda’s trying to find a way to get me home sooner, and it may work out. Right now, I fly to San Francisco, then on the Washington, where I spend the night. Then the return train trip back down to Raleigh. That would be OK, since I do not have any gigs for a few days. But home is home and it’s where I want to be. The bloggers’ cafe was the hot spot of the conference. I’m not sure why I was not drawn to the spot last year. There seemed to be a contentiousness there while the cafe was entirely friendly, jovial, and everyone was looking for help or to help. Although the the EduBloggerCon was a huge hit and hugely helpful, I think that the high point for me was the Leadership Symposium. It was a highly structured gathering, designed to generate some ideas for the development of a new National Technology Plan. It wasn’t easy. At my table, there were officials from state education agencies and outspoken independents, like me. There was a lot of tug-of-war, and the time constraints for our various tasks were extremely frustrating. If asked, I would suggest that next time, our tasks be fewer and simpler, so that we have time to delve more deeply into eachother’s ideas and perspectives. One of the things that frustrates me about these quick conversations is the need to rely on buzz terms. We all know what they mean and mostly agree with their direction. But what is needed right now is a richer description of exactly what project-based learning, student-centered instruction, and authentic assessment look like. It frustrates me because I feel that the time has come to move forward. But we will only be able to move with clearly described vision, not mutually agreed-upon neologisms. Leaning today must be more than conceptual. Textbooks and lectures are conceptual. Students must work their knowledge using literacy skills as tools. Teachers/educators need time to keep up. It needs to be part of the workday. Students may not want to use the technology the way we want them to — and this may not be a bad thing. Teachers need permission and encouragement to take risks. Someone at our table reminded us of the little picture puzzles that, as I recall, use to show up in Cracker Jack boxes. You had to arrange the tiles so that they made a single picture, but there was only room to move one of two tiles into a single empty position at a time. Nothing else could move until this last tile moved first. My group was assigned to look for ways to make learning more engaging. So what would engaging assessment look like. What kind of accountability scheme might we grow into, that is fun to participate in, both for students and for teachers? How might we make assessment and accountability an integral part of the formal learning process — a learning process that comprises fun and engaging hard work? I’m looking forward to the NECC where the big new thing, the new buzz, is a style of portfolio assessment that integrates into the teaching, learning, classroom, school, and community cultures. I used that setting on my camera that take multiple shots, and this is the only one that came out nearly clear. I’ve seen it before, but, out of curiosity, I Twitpic’ed it this morning to see if anyone knew what it was. Here’s what I learned. This information was contributed to RoadsideAmerica.com by Willie Zaza in June of 2001. Someone else added this later. It’s known officially as Meade’s Pyramid. It stands 23 feet tall, is built of granite, and was erected in 1898 by the Confederate Memorial Literary Society, who originally just wanted a sign. 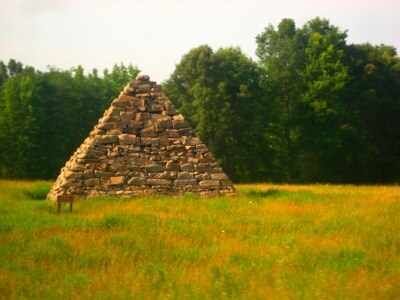 The railroad vetoed that idea, so the Society built a 17-ton pyramid. What I find interesting is that I learned of this, in less than ten minutes, by way of Jo Fothergill, from her home, in New Zealand. Who says learning has changed! I’ve been at home for just more than 24 hours. It was a good day — a fathers day. The kids gave me two seasons of The West Wing, including season 4, whose first episode, “20 Hours,” is the most YouTube’d WW of all seven seasons. I spent the last couple of hours scanning through NECC blogs. It’s been fun and has helped me to find the spirit. It would be easy for me to say that I go to so many conferences that one more… But it’s not the case. NECC is huge — in just about every way you can imagine. The most interesting post was from the SL team at Discovery Educator Network. In NECC Prep Sessions a Big Hit, Lori Abrahams describes a series of recent sessions put on by DEN with reps from ISTE, including program chair, Anita McAnear. The purpose of the sessions was to provide some tips for people who will be attending the international edtech conference for the first time. Many conferences have sessions first thing, first morning, for newbies. But advancing this one to Second LifeTM makes a ton of sense. Several people talked about sessions they will be conducting, including Harry G. Tuttle, who’ll be sharing ideas about assessing Web 2.0 tools. I have to confess that there’s a place on the back of my neck that always starts to itch when I see someone wanting to evaluate technologies. I can’t help but feel that as soon as you start applying rules, the tech stops being the Swiss Army Knife that it should be. But Tuttle makes an excellent point in his post, Woeful Book Wiki Turned to Wow Book Wiki. As he has visited many school and classroom wikis, he has become increasingly discouragedl, as he notices that..
Harry then describes a wonderful alternative that creatively expands the wiki from collection of ideas, to an idea collective. Read his blog post for the details. Of course, this is not an uncommon situation. So many people come to these conferences looking for the tech de jour. Then they bring it home and integrate the life out of it. It may be the way that we present the technology — like snake oil salesmen. I’m raising my hand. Or perhaps it’s just what people come to the conference for — to discover and embrace the new cool thing. 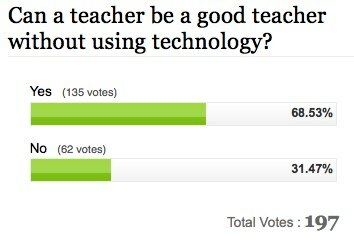 I would like to suggest, for the coming conference, a moratorium on the phrase, “Integrate technology.” Don’t say it at NECC. Don’t even think it. I’ll have nanobots loose at the convention center floating on the breeze, listening for utterances the IT. If you say it, or think it, my nanobots will hone in and drain the electricity from your iPhone. I’ll see many of you there, for the few days I’ll be attending NECC. This continues to be an amazing trip — if only because I left home last Friday and have yet to get on an airplane. I love it. Yesterday, I was lucky enough to catch the Acela high speed train back from Boston to NYC, arriving at 8:00. The hotel is on a fairly shady street, so I stuck to my room last night, forgetting to e-mail my brother with a breakfast restaurant suggestion. A little surprised that a New Yorker would ask a North Carolinian for restaurant suggestions in NYC. I’d caught sight of a dinner on my walk up from Penn Station, but couldn’t remember the name this morning. 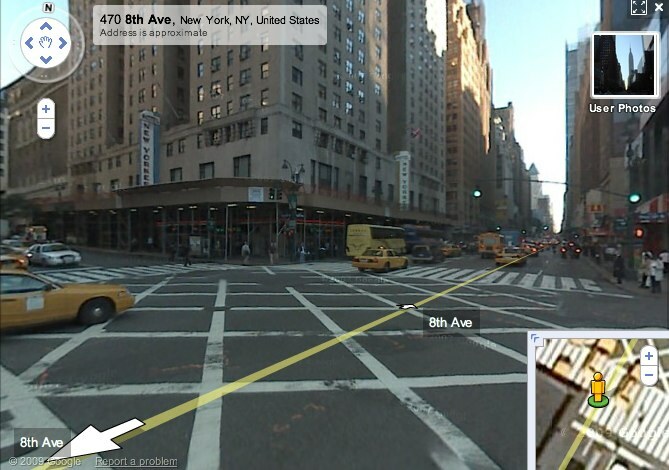 The Tick Tock Dinner, as seen from Google Street View. So, and this is a first for me, I pulled up Google Maps, found Penn Station. Then I switched to “Street View,” retracing my walk, and there it was/is the Tick Tock Dinner, just beneath the Hotel New Yorker. It’s OK. I’m not ashamed of being old enough that this stuff still AMAZES me. It was an excellent day at Nobles and Greenough School yesterday for their Emerging Technologies Conference. I was a little intimidated by the fact that their last two keynotes were Alan November and Will Richardson. But the day went off well, made new friends, and was very pleased to witness Liz Davis’ first large audience presentation/keynote, which she did with Tom Daccord — obviously seasoned at this sort of thing. She was at ease, funny, highly expressive (which is important on a stage), and passionate. She did GREAT. There was a lot that I could spout from the Web20 koolaid. But what’s tricky is that we all have our own vision of the profession and makes it a profession — and it isn’t right for me to intrude on his vision with my own. So what does this messy new information landscape that I’m suggesting we make significant use of, do to the profession? Please comment! But here’s a paraphrasing my answer — or what I was trying to convey. “I believe that the professional educator, today, must engage in this open and global conversation. We should blog (or whatever), reflecting on our experiences and our profession. We should actively and generously share what we’re learning, contribute to the conversation and the the growing body of knowledge, and we should invite other stakeholders into the conversation where appropriate. Our professional and personal image should become dependent on the quality of our communications, the logic and validity of our ideas, the threads of connection with the ideas of others, and our knowledge built from success and failure. I just discovered a Tweet-reply from VWassessments (Kathy Landerson). I wonder how your term for your game puppet affects your relationship with the player identity and/or the player’s relationship with the game? I’m sure somebody’s researching that. For that matter, how does the students relationship with a end product affect his or her relationship with what’s being learned — or how well it’s being learned? I always preferred being the race car. Landerson, Kathy. 11 Apr 2009. Online Posting. Twitter. Web: 13 Apr 2009. I am still working on this article on virtual worlds in education, an ran across this report from January 26, 2009. According to Virtual Worlds Management, more than 200 youth-oriented worlds are currently live or in development. This is an increase from 150 known youth-oriented virtual worlds in August of 2008. 38 of the virtual worlds products are explicitely intended for children six and younger. Two are being developed in Australia, 2 in Belgium, 8 in Canada, 2 in China, 3 in Denmark, 4 in Finland, 2 in France, 4 in Germany, 3 in Israel, 5 in Japan, 4 in Korea, 2 in Spain, 2 in Sweden, 14 in the UK, and 126 in the U.S.
One is in Alpha, 10 are in closed beta, 36 are in open beta, 7 are in concept, and 26 are under development. Most of the rest are live. “200+ Youth-Oriented Worlds Live or Developing.” Virtual Worlds Management. 2 Feb 2009. Show Initiative, LLC. 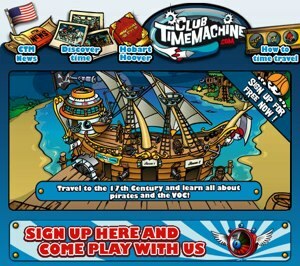 26 Jan 2009 <http://www.virtualworldsmanagement.com/2009/youth-01-26-2009.html>. I have right fond memories of my time at the Naace 2008 conference in Torquay, England, this time last year. This is partly because both Brenda and Martin went with me, train’ing through the country side, the day we spent in St. Ives, and the nearly 24 hours we spent learning the subways of London. Then there was the part that was the hospitality of the folks at the conference. Honestly, I felt so far behind where those folks were, not so much from practicality as in the direction and momentum for change for schools in that country. Last year, the Rt Hon Jim Knight MP, Secretary of State for Children, Schools and Families, presented the opening keynote from Second Life™. I was blown away by the (political) courage involved in that. This year, he’ll be interacting with conference attendees via Twitter. I can’t help but believe that when our department of education (not just edtech) is interacting directly in the conversations of in-the-trenches educators in U.S. schools, we might, then, start seeing progress and momentum. 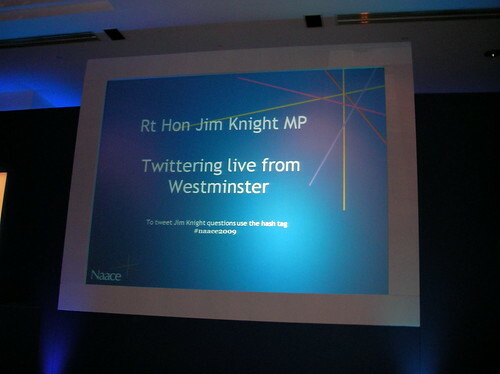 Naace 2009 is taking place right now, and I’ve added Twitter tracking to Hitchhikr. Naace can be followed at http://hitchhikr.com/?id=410. I didn’t have to be invited. I’ll be doing some of my regulars, a pre-conference workshop on PLNs and my virtual worlds session. However, I’ll be doing a new one, called The Foundational Structure for Learning 2.0, and I’m still working on it. Also, for fun, Will Richardson and I will be doing a conversational (unconference) session together, back by popular demand from a similar session two years ago. Anyway, it will prove to be an adventurous three days of conferencing in Raleigh, named for Sir Walter, the great British colonizer, and watching Naace, this year in Blackpool, England. 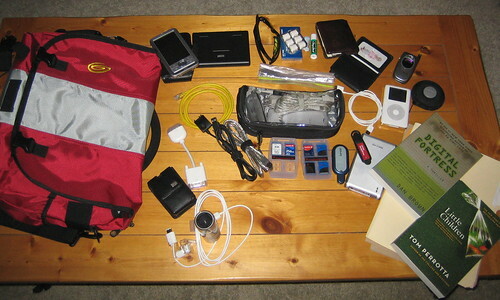 I’ve been at home for a couple of days doing some planning for upcoming events — and trying to find a better Linux distribution for my netbook. Linux can be a real time-sink for someone like me, who would really “..love it if my computer could do this too.” Anyway, I settled on something called Crunchbang Linux, a derivative of Ubuntu with the Kuki (pronounced “cookie”) kernel inserted in. Kuki has been enhanced for the Acer Aspire One’s peculiarities. I hope that those last two sentence impresses you. I don’t understand it worth a flip, but it’s working just great, and I’m blogging on my Netbook right now at Starbucks. 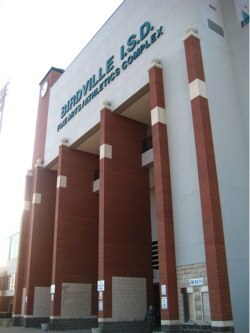 The Athletic & Fine Arts Center. The buzz from my day (Monday) at Region XI in Texas is still ringing in my head. I knew that it would be a different sort of day, when I walked into the “Fine Arts Center,” whose sign actually read, “Atheletic and Fine Arts Center.” I walked in, through a wrought-iron gate, across a high cellinged entranceway, through another opening out into a huge football statium. OMG, I’m going to be soooo late. I walked back into the entranceway where there was a ticket office, a worker having just entered through the glass door. I followed her in and asked about the Region XI event. In typical Texas friendliness, she ushered me out to some double doors, just outside the gate, and up some stairs, where folks were preparing a huge room for the event — the inclined celling echoing the statium seating above. It was a good day, however, with, by my approximation, between two and three-hundred folks. The intended audience was library media specialists, but many of them brought teachers, principals, and even superintendents with them. The topic was contemporary literacy and the information environment that it rises out of. I took three things away from the event. One was the graying, yet rather aggressive school librarian, who launched her hand into the air when I asked the younger educators among us to share their experiences with social networks. She insisted, and many concurred, that social networking was no longer the exclusive domain of the young. This rang true, considering a blog I recently discovered, Social Networking Watch. In a January 14 post, (Older Adults Among New Members on SNS), Mark Brooks graphs Social Network Service members by age, revealing that a full 36% are older than 44 — 7% older than 64. The second thing I came away with was a story about a fourth grade class who visited the local Rotary Club (May have been Lions Club) to inform community leaders of how they were using technology in their classrooms. They did their presentation, and then went about talking withmembers during lunch, taking pictures and video clips, and conferring with each other in the back. In the back, they were mixing the content they had collected and they ended the meeting with a video conveying what they had just learned about Lions Club International (May have been Rotary Club). The members were so impressed that the local Chamber of Commerce commissioned the class (4th graders) to attend one of their meetings and to create a promotional video for the organization. The third thing (and their may have been a fourth, but I can’t remember) was a conversation that we had at the event and that I am starting to have with myself — about project-based learning (PBL). What got me started on PBL was another conversation I had with a superintendent from California recently, where he reminded me that PBL is outlawed in his state. All instructional techniques must be directly related to standards and research based — and project based learning was not allowed. I remember when this happened and it was years ago, so I’d figured that this edict had faded away — and most certainly there are many inventive educators in California who have found ways to include PBL in their classrooms. But I wonder if there is some distinction about what that Texas educator did and what many of us usually think of when we have students doing projects. My notion of projects has been to have students take a topic that is curriculum related but something that they have a genuine interest in, and then asking them to research, become an expert, and then prepare some sort of presentation for the class. It might be a personal performance, a multimedia product, or just a report. 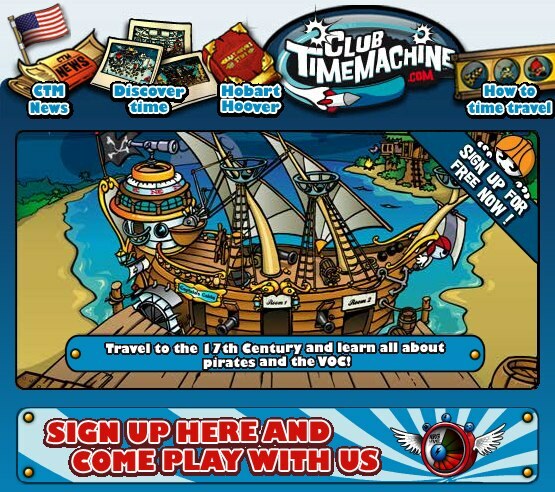 …focuses on student-driven service projects through the use of the latest in technology. EAST schools are equipped with classrooms containing state-of-the-art workstations, servers, software, and accessories, including GPS/GIS mapping tools, architectural and CAD design software, 3D animation suites, and much more. Students find problems in their local communities, and then use these tools to solve them. This is a pretty dramatic example. The simple difference that I see is that a job-based learning activity produces something of value to others and its value/impact extends beyond the walls of the classroom or school. There is NOTHING new here, and I am not suggesting a change in educational terminology. It’s just that the idea of learners using their education as a tool for benefit or change is one that deserves repeating every now and then. You can learn about the water project and others from this TICAL podcast. I spent the last part of my time at the computer yesterday, listening to a recent Women of the Web podcast interview with Dr. Gary Stager. It was a good interview and Stager seemed, on several occasions, to be talking straight from my speaking points — something that is deeply gratifying to me. He did a better job than most at balancing his constructivist approach with the fact that this is not an either or proposition — that although consciously constructing learning from previous knowledge, frame of reference, and skill is preferred (and natural IMHO), some times and for some objectives, teaching to the students is called for. 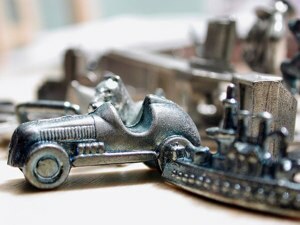 As is often the case, the conversation veered over to the ever persistent question, “How do you reconcile these more progressive constructivist strategies with the demands of standards- and accountability-based teaching. It’s a hard question to answer and I hope it is a temporary question. My hope is that “modernized” schools will come to value what students are capable of learning and doing with what they are learning, than what we are capable of teaching. It was after a rather short play-out of this conversation that things shifted again — “How do you reconcile progressive, constructivist, project-based learning with teachers who are more comfortable with the traditional direct teaching approach — especially as many of these teachers seem threatened by more student-centered education. 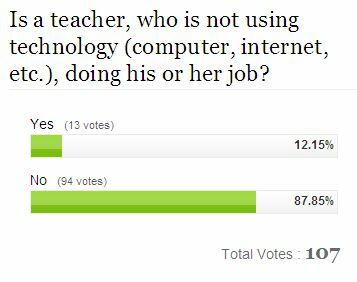 It all reminded me of an instance, about 20 years ago, when I was director of technology for a rural school district in North Carolina. We had a lab of Apple IIe computers at the high school, where computer applications was taught. 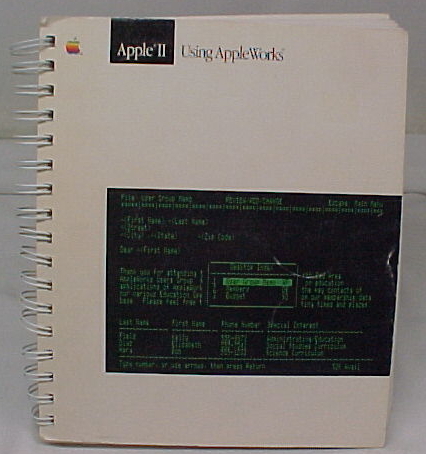 They taught AppleWorks, which ran off of a five and a quarter inch floppy disk. Raise your hands if you remember those! This was a first for me, but it immediately made sense. Learning to rely on a users manual to learn how to operate a new piece of software or operating system seemed like a valid technology skill. But other teachers at the school didn’t make that connection. In fact, there was a vehemence to their objections that seemed down-right irrational in its emotional intensity. They said that that art teacher was not doing his job, that the students were doing it for him. Being John Bell, he let it run its course and the controversy died down. But I’ll not forget that. I wonder if a reason for many of our students’ lack of enthusiasm for learning is that it isn’t learning that they are doing. The the active ingredient of traditional classrooms is teaching. Might our students become more excited and engaged by what they constructively learn than what they are taught.